Home » Top 10 Beaches in France: the good, the rad & the sandy! Top 10 Beaches in France: the good, the rad & the sandy! We’ve compiled Top 10 list of great beaches in France you’ll want to visit – whether you’re looking for sightseeing, sandcastles, sophistication or surf there’s a perfect French beach for you! The Bay of Arcachon on the Atlantic coast of France has a popular sandy beach where you can try out various water sports or relax in the sunshine at one of the many bars and cafes. The beach itself is great for families and has everything you need for a day at the seaside. The main attraction is the nearby Dune of Pilat, it’s the tallest sand dune in Europe! Climb up the steps or scramble up the sand to reach the pinnacle at 110m above sea level so you can enjoy the fabulous views. Hossegor beach is on the south west coast of France and is a world famous destination for surfers with some of the best, most reliable surfing conditions in France. It’s a vibrant resort with buzzing nightlife as well as great beaches. Even if you’re not going to catch a wave yourself it’s worth a visit to watch the experts do their thing! The Normandy Landing Beaches are a fascinating mix of family-friendly golden sands and evocative relics of WW2. The beaches stretch along the Normandy Coast and include Sword beach, Juno beach, Gold beach and Omaha beach. Look out for the scars of battle on the cliffs, original bunkers and memorials to the troops who lost their lives here. Pampelonne beach is the exclusive resort to the east of Saint-Tropez. The golden sands and turquoise sea are beautiful and well served with luxury restaurants and clubs. Go to star-spot and enjoy the timeless glamour of the South of France. 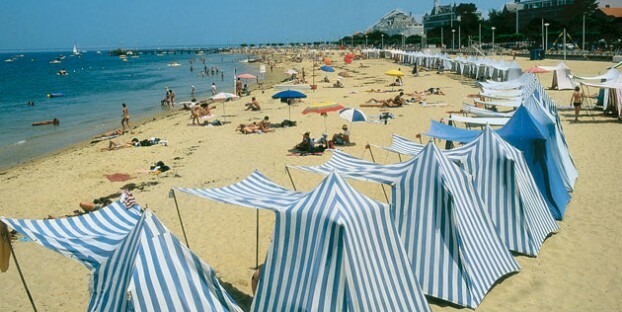 La Baule in Pays de la Loire is a fabulous choice for families with miles of sandcastle-grade golden sand and a charming promenade offering all-important cafes and shops for the essential ice-creams and snacks. The sea is calm and safe for swimming and life guards are on patrol in high season. St-Malo is better known for its port and pretty walled town but the beaches are another attraction for this easy-to-reach Brittany destination. The sandy beaches are fully revealed at low tide when you can walk out to rocky island outcrops and explore the rockpools. There is also a seawater swimming pool with diving board if you fancy a bracing dip in the sea! Ile de Re is a favourite destination for tourists. The beautiful island is reached by toll bridge and sits off the coast near La Rochelle. With over 10km of fine white sand beaches along the south coast of the island you’ll be spoilt for choice, and thanks to the island location it’s never too crowded. It’s not only the sea that provides wonderful beaches to visit in France, there are plenty of lake beaches too. Lake Salagou in the Languedoc is one of the most popular and features a stony beach and a number of secluded coves to discover and explore. The lake is perfect for swimming and sailing and there are plenty of water sports rental outlets and cafes available. For a beach with real impact visit the river beach at the Roman aqueduct Pont du Gard. Paddle, swim and picnic on the stony beach under the shadow of the imposing Roman arches – the perfect place to cool off on a hot day in Provence. If you are holidaying inland the Dordogne river offers a choice of sandy beaches along its banks that are ideal for swimming, paddling and sunbathing. Plage du Pont de Vicq is a popular choice and has a café and lifeguard during high season. The pretty village of Limeuil has a large sandy beach with shallows for safe paddling at the river’s edge. Plan your beach break in France by finding the perfect self-catering holiday home from our huge choice of cottages, villas, gites and mobile homes. Don’t forget you’ll get 20% off your Brittany Ferries crossings when you book with us so you’ll have more €s to spend on delicious ice-cream! Top 10 Recommendations for a Fabulous Holiday in Brittany!